These are terrible. A curse, in that, so-easy-to-make addictive sort of way. I made a single batch, and they were gone in minutes. I couldn’t make out all the words around the mouthfuls, but from the wild gesticulations, and later exhortations to please make them again, they seemed to be a great success with the test subjects. You can use whatever variety of sausage you like. I happened to have some wild boar sausages handy, and they suited the recipe admirably. If you can get game sausage of any kind, it’s definitely worth a try, as they help defamiliarize the experience. In any case, the resulting combination of puff pastry (how could you go wrong?) and juicy sausage is a long tried and much loved pairing. The outer pastry shell stays flaky, while the inside soaks up some of the flavorful juices from the meat. 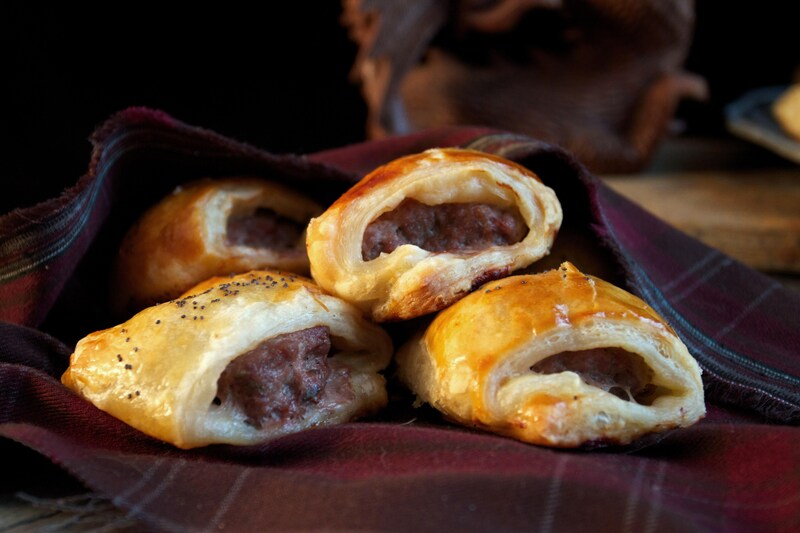 This recipe also has the added appeal of making small enough meatrolls that they would be snitchable from the kitchens of castle, fortress, or cottage, as Menolly proved in the books. Double win! Unfold the sheets of puff pastry, and cut lengthwise down the middle. Make five more cuts width-wise so you have 12 long pieces total. Divide the sausage meat evenly between the strips of dough, then seal the ends together with a swipe of egg. Arrange the sausage rolls on the prepared baking sheet. Brush with egg, and sprinkle with seeds. Bake for around 20 minutes, or until they’re puffed up and a nice golden brown. Allow to cool slightly before serving. You know, I found myself thinking of you while I read Mercedes Lackey’s The Firebird. I wondered how you’d make the apples from the Katschei’s orchard, especially since you’ve made the ones from Snow White. Anyway, thoroughly enjoyed reading the reactions to your meatrolls! :D Made me wish I were there, LOL. I’ll have to check those out! Thanks for the tip! Duly noted! Was there anything in particular that gave you pause? I actually used filo and there were just so many layers to the dough. And I couldn’t tell if the ones in the picture were rolled or folded, if they were baked open on the end, or cut open for the photo. The children were fascinated by the papery quality of the dough and are coming up with all kinds of ideas for making treats with it in the future. Quick question about the sausagemeat – would straight up sausages work (my local farmer’s market has emu sausages and venison summer sausages that I’m looking at for this), or is there something I should know when shopping for the meat for this? Love the recipe! My boys can’t get enough. Do you brown the sausage before you stuff them or will the 20 min in the oven be long enough to fully cook the raw pork? These look delicious! I’d love to see a few more recipes included here, such as klah, bubbly pies, heardbeast, wherry, and wines (especially Bendan). With just a little research, you can find plenty of Pernese fare outside of the Dragonriders guide. I would stay away from one recipe for klah on YouTube, however. Interesting! As soon as I discovered your blog (via a tweet about Elder Scrolls recipes, which I am very much looking forward to), my first thought was to wonder if you had any recipes from Pern…. and my second thought was to wonder if I still had that Guide to Pern with its small variety of recipes–and some few Earth equivalents–within. I will have to try these meatrolls some day… and also see if the Guide gave a version so I can see how they compare.